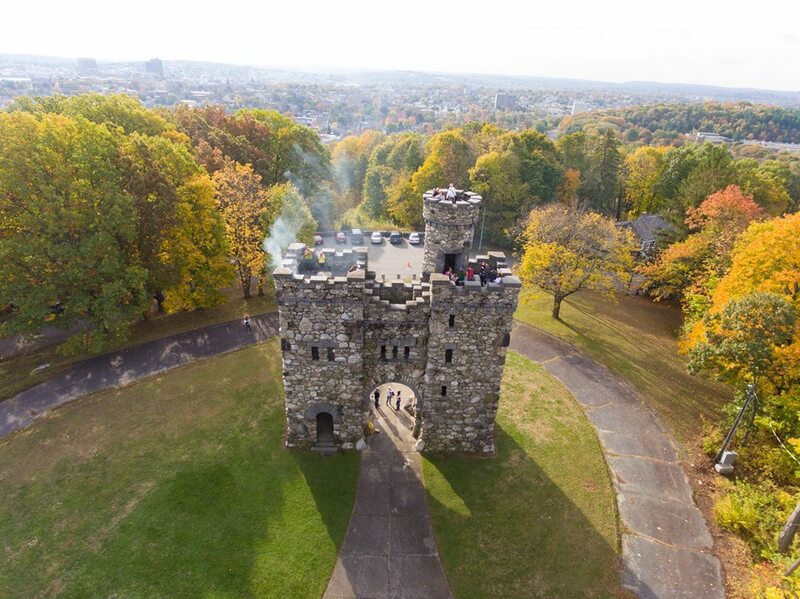 Bancroft Tower — Park Spirit of Worcester, Inc.
Park Spirit first opened Bancroft Tower to the general public in October of 2014. As an organization, we thought it was important for Worcesterites and beyond to have access to this impressive and historic structure and the spectacular view that is out of reach for 11-months of the year. Park Spirit opens the tower every Sunday in October (weather permitting), allowing all to enter the Tower and explore its reaches. Historical presentations are placed within the Tower, presenting information about Stephen Salisbury III, the Tower's creator, and George Bancroft, the Tower's namesake. Parking for the event is available on a limited basis directly across from the Tower and along Bancroft Tower Road as it extends down towards Massachusetts Ave.
Park Spirit volunteers are on site to provide historical background to visitors and to supervise each level of the Tower - as it is a 56-foot high structure that was built before modern safety standards were put in place. Built in 1900, the castle-esq monument was named after Worcester native, former Secretary of the Navy, diplomat, and historian George Bancroft. The tower was built by Stephen Salisbury III, the last of the Worcester’s esteemed Salisbury family, who built it to honor Bancroft - his father’s childhood friend. The tower was built in 1900 using horses and carriages to transport the large stones up Prospect Hill. The land the tower was built on was owned by Salisbury. The area around the tower did not become a park until 1912, when the Trustees of the Worcester Art Museum donated it to the city (Stephen Salisbury III left much of his estate to the Art Museum). Salisbury Park itself extends down almost to Park Ave, as it includes both of the wooded areas that line Massachusetts Ave. The paved road around the Tower was open for driving until the 70s-80s, when it was closed off to motorized traffic with the installation of stone pillars. Bancroft Tower was permanently open and accessible to the general public until the 1980s. During the 1980s, it was heavily used as a party spot and known as a haven for illicit activities. The immediate neighborhood surrounding the Tower was largely responsible for closing the Tower, and rightfully so, with the frequent disturbance of unwelcome parkgoers after hours and the safety hazard that is posed by a 56-foot, unmonitored stone tower. A new addition to Salisbury Park is a newly cut trail segment of Park Spirit's East West Trail that runs through the steep, wooded area of the park - leading down to Park Ave towards Institute Park. The trail had been overgrown for many years and it was only during the summer of 2016 that the Park Stewards Summer Workers recut the trail to incorporate it into the cross-city East West Trail. Guided hikes of this segment of the East-West Trail will start hourly during the October 1st Park Spirit Presents: Bancroft Tower at Salisbury Park. Park Spirit opened the Tower to the general public in 2014. Prior to this open house, the Tower was open to the general public on an inconsistent and intermittent basis. The Greater Hammond Heights Neighborhood Association (serving the neighborhood around the Tower and the homes on Prospect Hill) has held private/neighborhood events at the Tower over the years, such as their well known 'Haunted House' event in October. In 2016, the City's Park Stewards Summer Work Program helped to recut a historic trail down from the parking lot through the woods to Massachusetts Avenue, transitioning a section of the East-West Trail from pavement to wooded trail. The trail runs through a steep, wooded section of the park and transports the hiker from the top of Prosect Hill, down to Park ave to Institute Park.